By the time you receive this, Nome is likely to have endured our first overnight frost of the approaching winter. The leaves on many tundra plants will already be red and golden, as they prepare to bed down during the long cold. As with life, the arctic summer can seem too brief. It’s followed, usually, by months of intense storms � for Nome, devastating storms during the past two years. We pray for everyone’s safety, and for the strength to endure. Thank you so very much for your kindness, your faithful help and your prayers for our mission’s work. In this region where poverty, suicide and accidental death, just to name a few ills, are endemic, we are a 24-hour source of inspiration, as well as a forum for Alaska Native voices, a source of critical news and information, and a constant positive companion. A VISIT FROM THE SENATOR: (left) U.S. 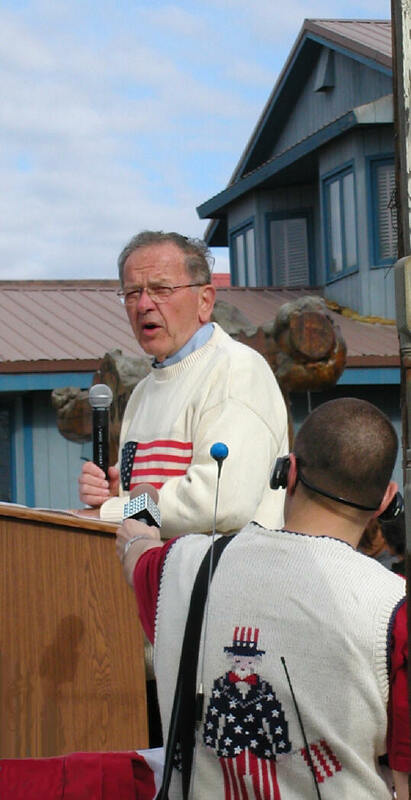 Senator Ted Stevens delivers Nome’s Independence Day speech, while Paul Korchin (back to the camera) holds the microphone that carries the event live over KNOM. Senator Stevens was a good friend of KNOM long before our call letters were selected. In 1969 and 1970, he sliced through mountains of red tape to get our license approved by the FCC. Now third in line for the Presidency, Stevens was escorted by a large number of Secret Service agents, an unusual sight in frontier Nome. During the town’s July 4th street games, Stevens competed in � and won � a race for walkers over the age of 80. The senator was given a ticket good for the $5 first prize, though no one can say if he actually collected it. 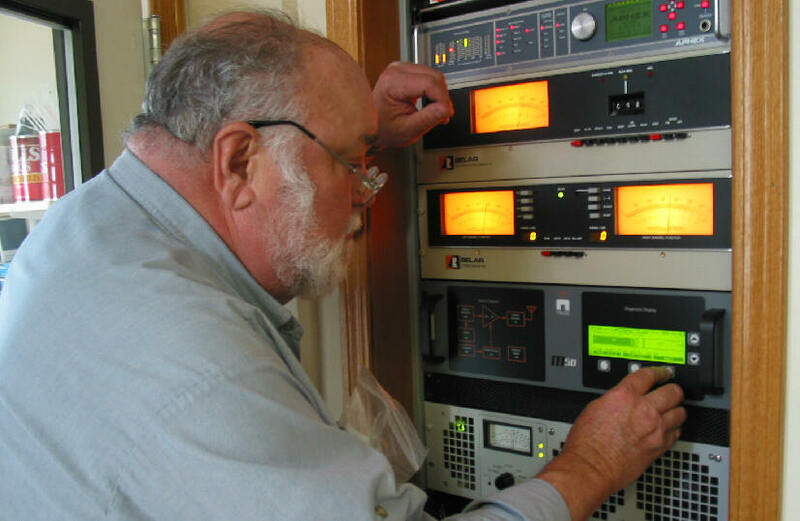 Our radio station ministers to isolated villages throughout 100,000 square miles of Alaska. INSPIRATIONAL SPOT: Look at your hands. In this age of the machine, we're liable to forget how many things can be accomplished only by our hands. Comfort someone in sorrow, brush away a tear. Our hands can be instruments of God’s work. They are capable of so much good. INSPIRATIONAL SPOT: Sometimes the Lord calms the storm. Sometimes He lets the storm rage, and then He calms us. GOOD TO HAVE LES: (left) Former volunteer and 6-year KNOM chief engineer Les Brown has visited twice from Palmer, Alaska this summer. Here, he checks a piece of equipment that connects to our FM transmitter. Les also volunteered to build furniture, sort through storage, and repair all of the little routine dings at an active radio station, such as broken headphones. FAREWELL: We bid goodbye to Eric Guthier, who returned to Akron, Ohio after a year of service. It was au revoir but not goodbye to two-year volunteer Liz Recchia (left, below), who continues to help out at the mission here and there while working full time for Nome’s campus of the University of Alaska. We pray for these fine young people, and thank God for the generosity of their service. 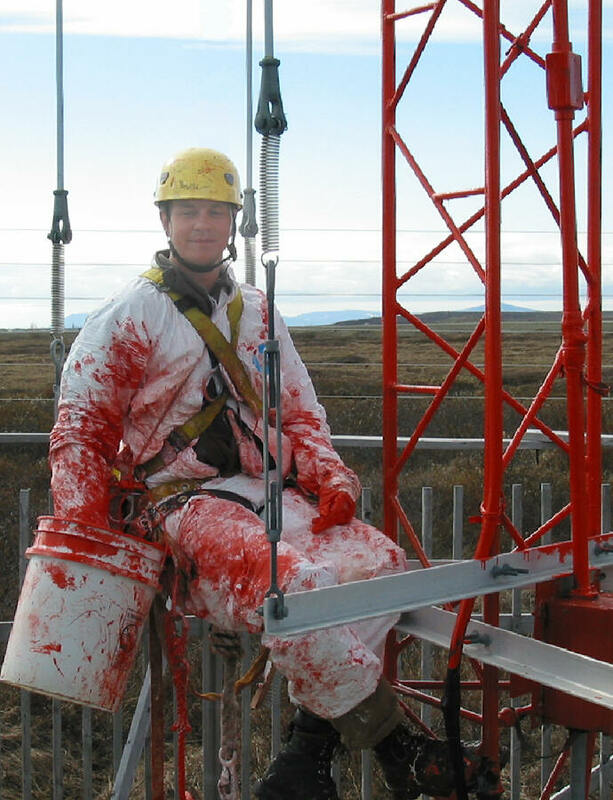 ALL WET: (left) We ran out of space last month for this picture of tower rigger Josh Morris, who re-painted the KNOM AM tower early this summer. Josh proves that you can’t get the job done without covering yourself with aviation orange pigment. Josh and his dad Bill plumbed the 236-foot structure. It appears that the north guy anchor, a buried block of concrete, is shifting in the permafrost, something that is not immediately serious, but will need attention within a few years. The oldest Catholic radio station in the United States, serving western Alaska, thanks to you. INSPIRATIONAL SPOT: Time...a minute...an hour...a day...Perhaps the most valuable of all of our possessions. It flies by without ever stopping. The way we use our time determines our happiness, our success on earth...and how we will spend eternity. BRRRR! 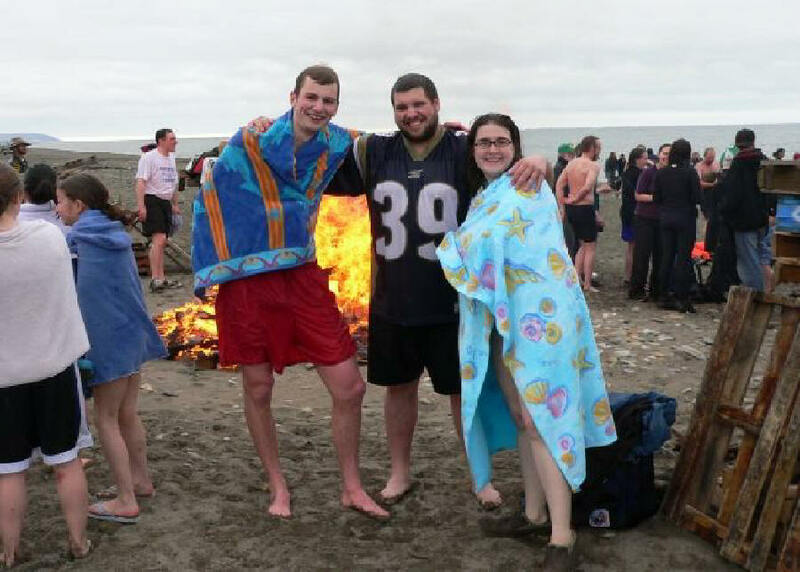 (left) KNOM volunteers, from left, Jesse Zink, Eric Guthier and Liz Recchia emerge from the Bering Sea during Nome’s Polar Bear Swim. Air and water temperatures were +46�, with light rain. The three decided to use this as their year’s official picture, rather than a more formal photo. 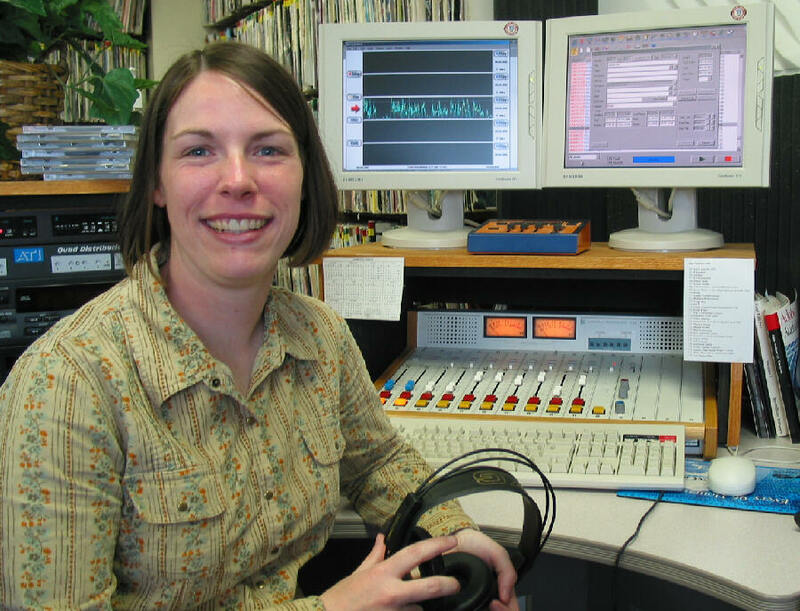 THIRTY YEARS AGO: In August 1976, as KNOM embarked on its sixth year on the air, nine volunteers hitched up for another year, while eleven newcomers arrived. Back then, general manager Tom Busch was the only employee, on a small stipend. As many as eight volunteers at a time were nurses and doctors, whose donated incomes from Nome’s hospital provided for 90% of the mission’s operating expenses. YOWCH! Nome’s electricity is generated entirely by diesel fuel. Recently, due to the high cost of petroleum products, an increasing surcharge has been added to our bills. Our most recent bill for a month’s worth of electricity for our 25,000 Watt AM transmitter was $6,836.09. It was up 26% from the previous month! UNSETTLING: We try not to think about it, but July 4th brought a stark reminder: According to military experts, the KNOM coverage area is probably among the only U.S. soil that is within range of North Korea’s two-stage missile. and many, many more topics, as we chip away at this region’s troubles. Please consider remembering the KNOM mission in your will, as many KNOM staff and former volunteers already do. We promise that we will prayerfully place all bequests into funds that are designed to protect the mission against future emergencies, and provide for future major improvements. INSPIRATIONAL SPOT: The sight of every dirty sock on the floor would be a blessing, if you were blind. The sound of children arguing would be a blessing, if you were deaf. Being able to mop the floor would be a blessing, if you were confined to a wheelchair. Paying the bills would be a blessing, if you were unable to move your hands. You can make every chore a prayer for someone who can't even complain about having to put up with them. WELCOME BACK!!! (left) We’re delighted to announce that 2002-4 volunteer Emily Barrett is back, in her old job as KNOM’s production director. 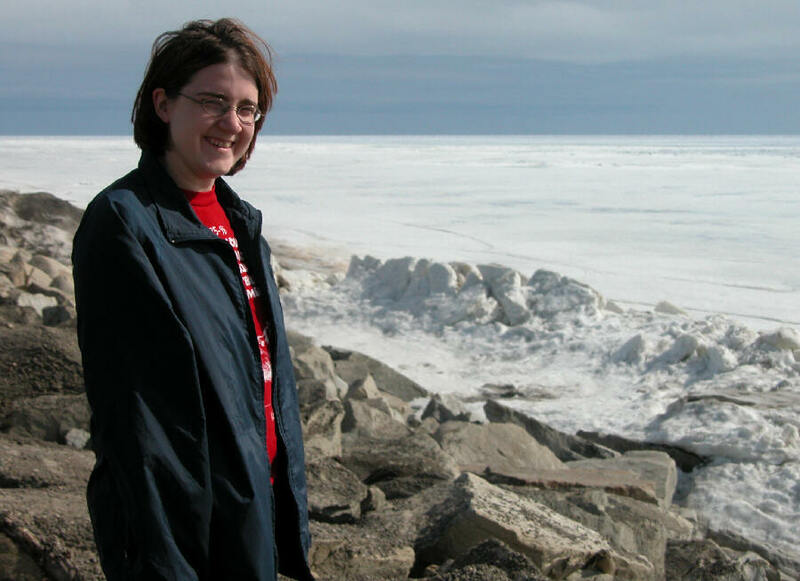 Originally from Clinton, Iowa, Emily recently earned a masters degree in social work from Saint Ambrose University. 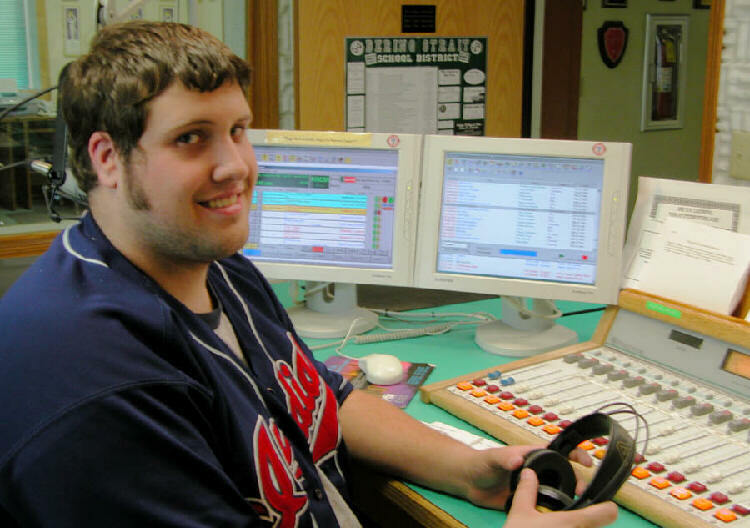 What’s a social worker doing at a radio station, you might ask? “I want to use my social skills in a creative environment,” Emily says. “LOCAL” NEWS: Few people would consider news from 520 miles away to be local. But in July, KNOM public affairs director Amy Flaherty was in Barrow, covering the Inuit Circumpolar Conference, a once-in-four-years gathering of northern peoples from around the world. Amy provided live news reports and many fascinating interviews. During her week in the busting-to-the-seams town, Amy bumped into several Prudhoe Bay workers who are KNOM listeners and remember her as “Amy in the A.M.” Prudhoe is more than 600 miles from Nome! 22,600: That’s about how many inspirational spots KNOM has broadcast so far this year, plus an equal number of educational ones. Thank you for making this possible! You are the strength of our mission. It is your financial help, and especially your prayers, that carry our work through each day. We pray that Our Heavenly Father rewards you abundantly for your kindness.